Reduces the Risks Associated with Extended Sitting - Studies have shown that sitting (and even standing) for prolonged periods of time is a risk factor for health. 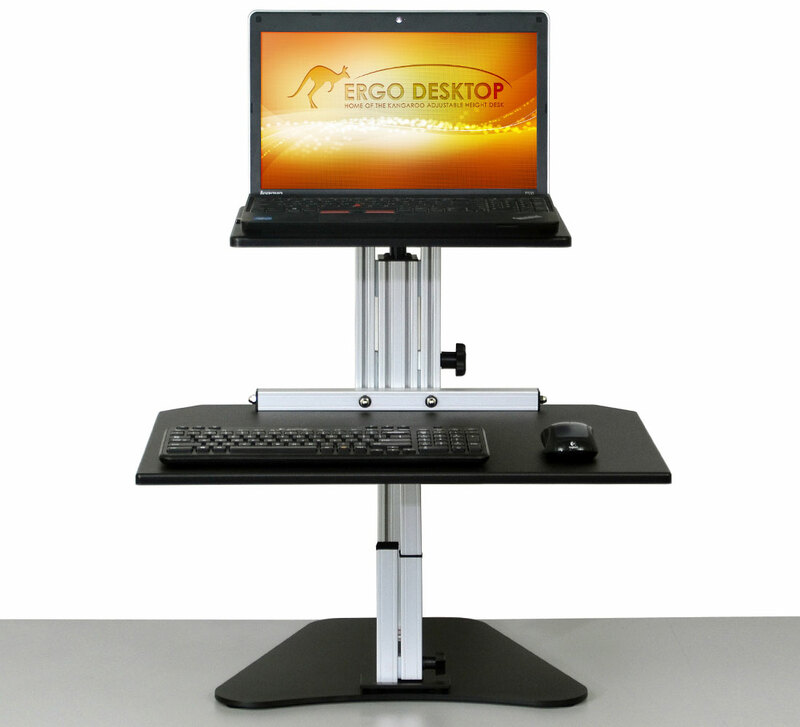 For those who work at stationary workstations, a desk that gives the user the option to sit and stand throughout the day will help break up those prolonged periods of unhealthy stationary work. 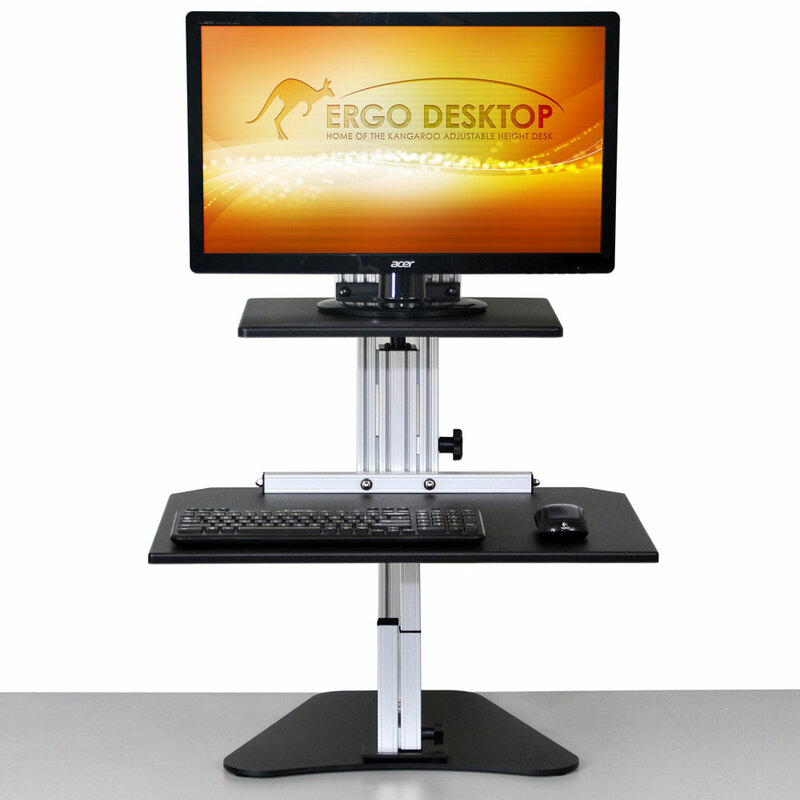 The Kangaroo Junior allows the user to adjust the height of the workstation to accommodate both sitting and standing positions whenever desired. Reduces the Risk of Neck Injury - One of several key risk factors for injury in an office setting is an improperly positioned monitor. 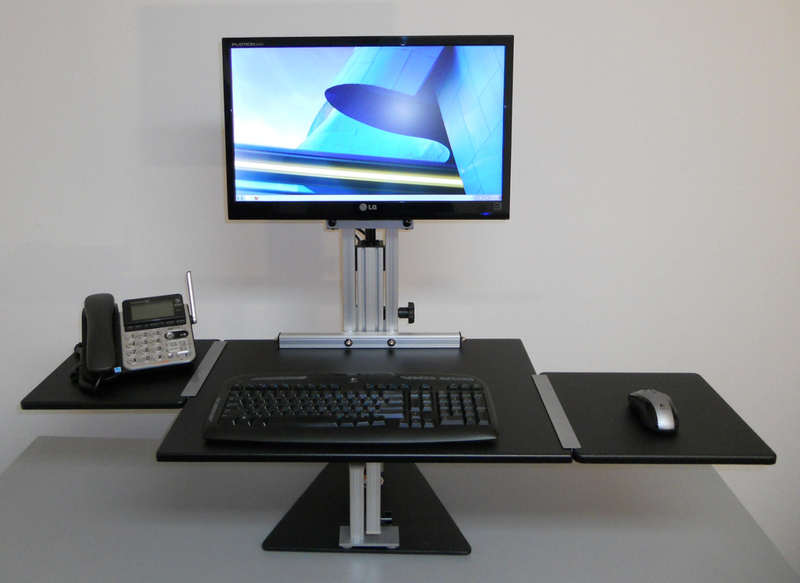 A good sit-stand desk will help eliminate that problem by allowing independent height adjustment for the monitor relative to the worksurface on which the keyboard and mouse are situated. 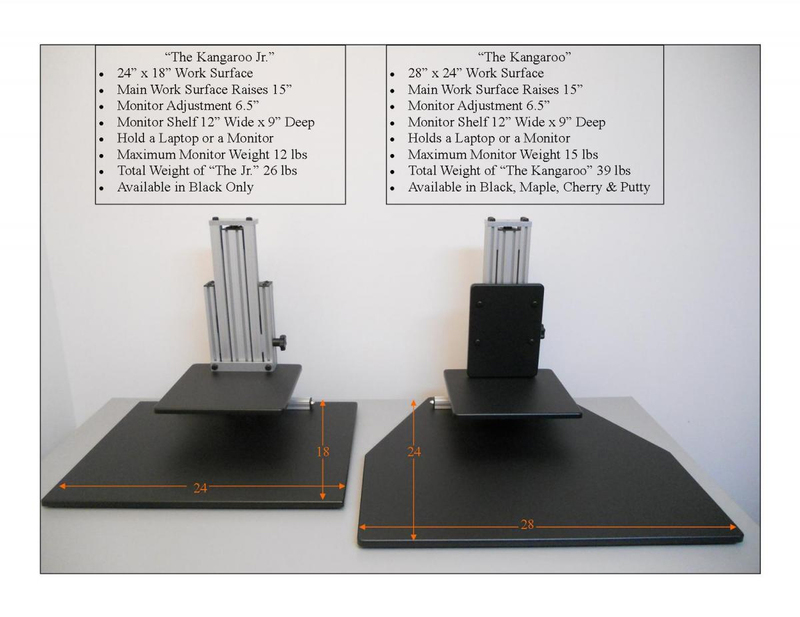 The Kangaroo Junior has 6.5" of independent adjustment to play with, making it easier to adjust the monitor height to a position that is optimal for the user, whether the user is sitting or standing. Learn More About Improper Monitor Position. 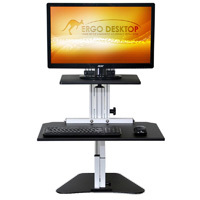 Reduces the Risks Associated with Overreaching - Unlike many other retrofit sit-stand desks, the Kangaroo Junior provides a generous 24" x 16" working area with plenty of real estate for the keyboard, mouse and other office devices such as calculators, phones, and tablets. Learn More About the Comfort Zone. Free Standing (Drill and Clamp-Free): The Kangaroo Junior is ideal for organizations that prohibit drilling into the desk, or clamping onto its edge. 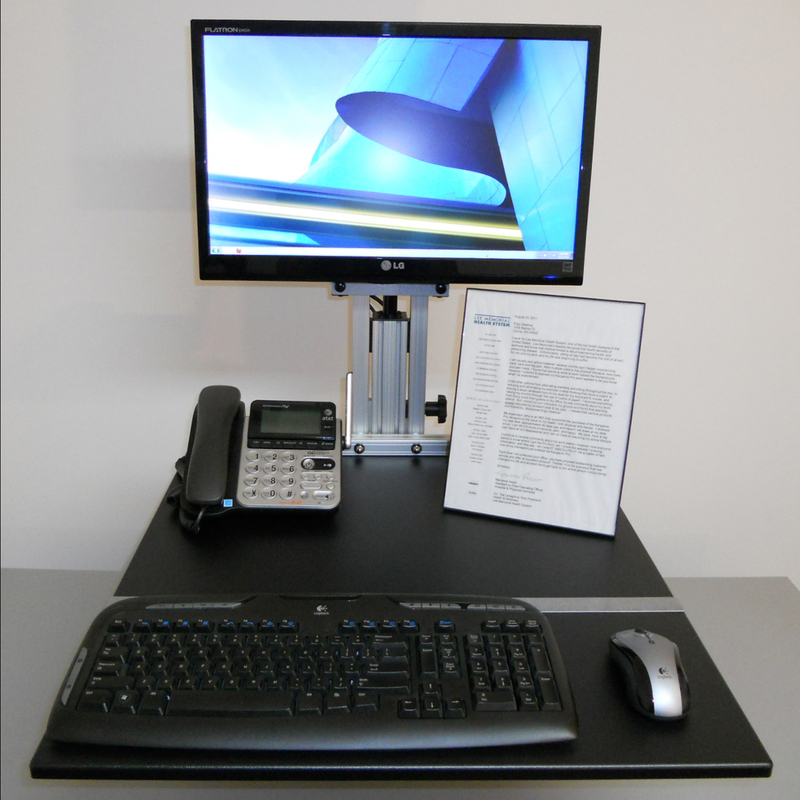 A heavy solid steel base allows the unit to be positioned on a desk top without creating a tipping hazard. Felt pads underneath the base prevent scuffing or scratching of the desktop. 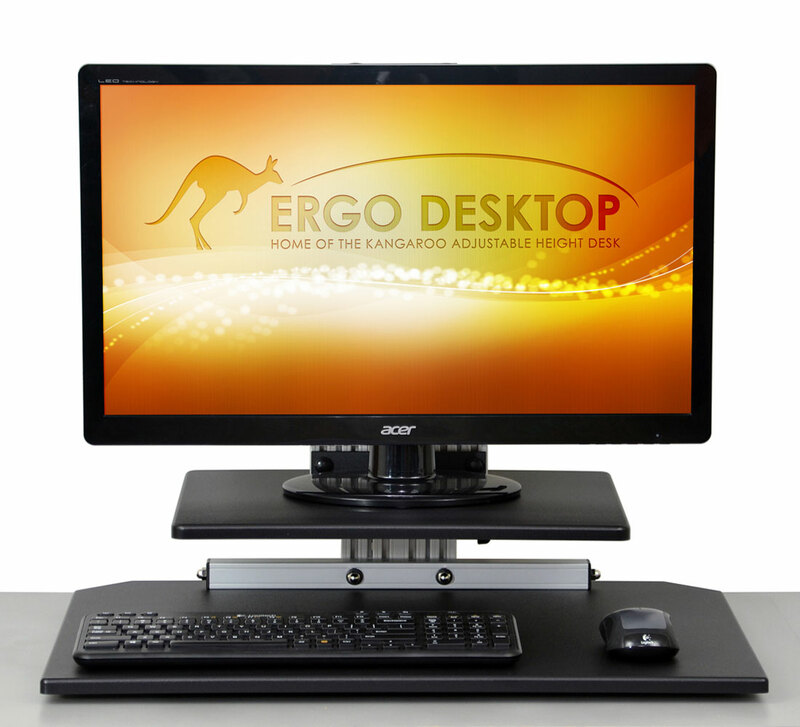 Easily Moved Base: Non-marking felt pads on the base of the Kangaroo enable users to slide it easily out of the way to access the desk top or to reposition the unit to a better location. 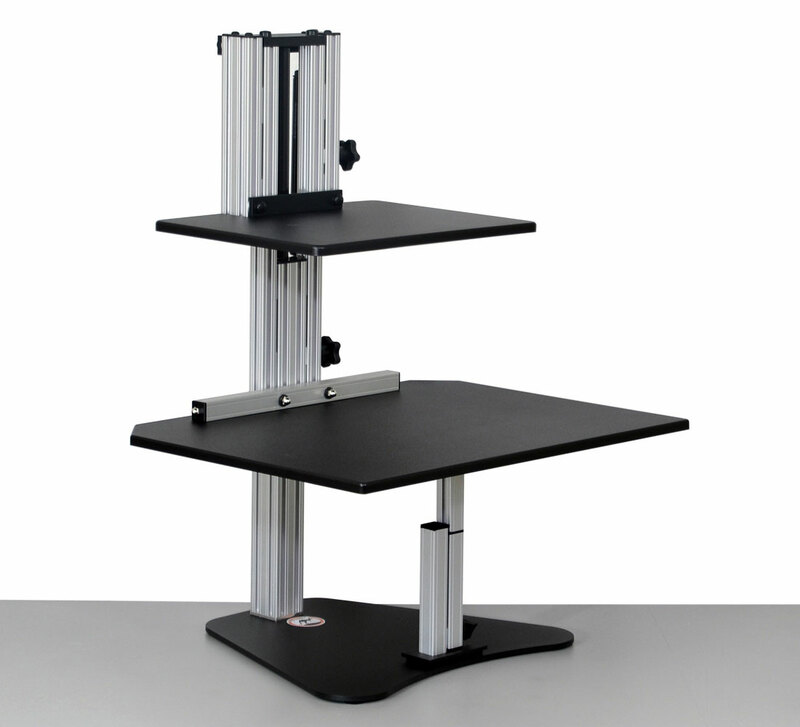 Shelf Unit for Single Monitor with Stand or Laptop: The Kangaroo Junior allows the user to use either a single monitor with its stand attached or a laptop. This is a great option for those with monitors that do not have hole patterns for VESA mounting or who prefer to use a laptop screen for viewing. Single Colour Finish: The Kangaroo Junior is available in Black colour only. Optional accessories can be purchased in the same finish.